This now TV entertainment BS. Honestly, game will push this into everything. I know they just add all these unnecessary stuff . Nope! I bought this console last weekend and considered taking it back. I finally decided to keep it and opened about 15 minutes ago.... Just setting up now. This now TV entertainment BS. Honestly, game will push this into …This now TV entertainment BS. Honestly, game will push this into everything. Its a really good buy as you are effectively getting the extra controller and the game for £10. It’s the best price if you want 2 controllers, if you’d rather have 2 games then Currys is better. I really wish there was a deal where I could get the console and an elite controller for £450. Thats all I want. I really wish there was a deal where I could get the console and an elite …I really wish there was a deal where I could get the console and an elite controller for £450. Thats all I want. Doable. Buy on amazon £449.00 with assassins creed and forza. Sell the games (£42, £30) sell the spare controller (£30) use the £102 you made to fund the elite controller. I believe Smyths are doing elite controller and forza 7 for £89(maybe £99) so you could go ahead and sell that forza 7 copy too. Doable. 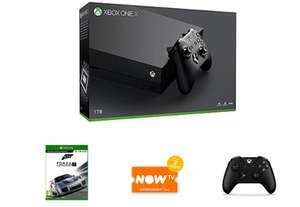 Buy on amazon £449.00 with assassins creed and forza. Sell the …Doable. Buy on amazon £449.00 with assassins creed and forza. Sell the games (£42, £30) sell the spare controller (£30) use the £102 you made to fund the elite controller. I believe Smyths are doing elite controller and forza 7 for £89(maybe £99) so you could go ahead and sell that forza 7 copy too. Great deal, looking to buy before Christmas or just after but it’s good to see bundles/deals on the ‘X’ heat from me. There were a lot of things about my post that would probably require a Delorean. It’s just my observations from the Black Friday weekend to be honest. Before xmas a similar opportunity to grab an elite controller and xb1x for £450 or under will present itself! There were a lot of things about my post that would probably require a …There were a lot of things about my post that would probably require a Delorean. It’s just my observations from the Black Friday weekend to be honest. Before xmas a similar opportunity to grab an elite controller and xb1x for £450 or under will present itself! I’m sure it will, I’m just an impatient so and so that would be happy with a £450 bundle from Amazon at the moment! Got Amazon vouchers burning a hole in my pocket so I might just pull the trigger on a Scorpio edition and be done with it! Waiting for it to go under £300 then maybe I'll be interested. There's nothing wrong with the controller they have currently so why would they change it? Not sure if anybody has already mentioned this (or knew already), but be careful in case you want to return this and just 'impulse buy'. I did that with a VR headset for the PS4 and got the 2 months NOW TV. Went to return and they deducted £8/9 of this and refused to refund the Now TV pass, even though it had not been used. Cracking deal though. I'm just torn between sticking with the Xbox One X or having the PS4 Pro for a bit less money. Decisions decisions! There's nothing wrong with the controller they have currently so why would …There's nothing wrong with the controller they have currently so why would they change it? Not saying anything wrong, but let's face it the controller is 5 years old! They've just released a great cracking new console and bundled in old 5yr old controller tech.... would it have cost them much to put in the new Elite controller? Probably not. Even the online tech reviews slate them for this oversight. Just realised.... not even a headset included, so a lot of money for better graphics! Crazy price for a console that plays PC games. I’m sure it will, I’m just an impatient so and so that would be happy with …I’m sure it will, I’m just an impatient so and so that would be happy with a £450 bundle from Amazon at the moment! Got Amazon vouchers burning a hole in my pocket so I might just pull the trigger on a Scorpio edition and be done with it! 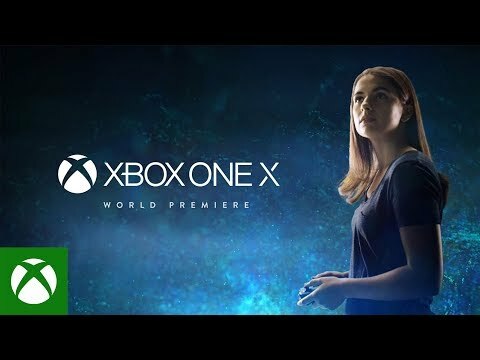 By the way, for reference I LOVE my xbox one x. I own a great 980ti gaming PC and yet the XB1X and a nice LG B7 OLED TV is possibly the coolest gaming experience I've ever had. Stuff like Halo 5 and Forza 7, even Fifa 18 looks incredible and runs smooth. Graphics kind of plateaued recently, so even though 980ti/1080ti is more powerful, the general level / experience compared to the XB1X is shockingly similar! I wouldn't be surprised if the 1180Ti and onward completely raise the bar again though! Great way to play The Witcher 3 at 60 FPS. I'll make do with the s if that's the case not much off a difference for £300 extra. No way will it take that long, its less than a month old and being heavily discounted already. It has a long way to drop to be competitive price-wise with the PS4 Pro. Yes, its a bit more powerful and has a HD blu-ray player (niche kind of obsolete technology anyway) but its a console so very overpriced and will have a very small market at its current price. No way will it take that long, its less than a month old and being heavily …No way will it take that long, its less than a month old and being heavily discounted already. It has a long way to drop to be competitive price-wise with the PS4 Pro. Yes, its a bit more powerful and has a HD blu-ray player (niche kind of obsolete technology anyway) but its a console so very overpriced and will have a very small market at its current price. niche obselete tech? its a 4k blu ray player! what you been smoking? Amazon have Scorpio Edition consoles for £449 in stock so good luck with that. Anyone have any idea what the trade in value for a xbox one s 1tb is? tempted with upgrading to this deal but my local game can't seem to figure out how to pick up the damn phone!! CEX offering £130/140ish in vouchers so hoping Game are giving something similar - otherwise it's going on ebay tomorrow.